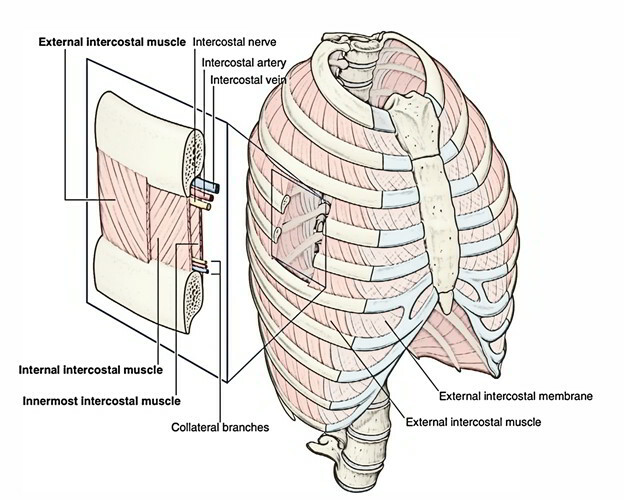 Within each intercostal space, the intercostal muscles are three flat muscles found that pass between adjacent ribs. They originate superiorly to inferior margin of rib above and insert inferiorly to the superior margin of the rib below and are innervated by intercostal nerves having root value T1 – T11. They extend from costochondral junction to tubercle of rib while anteriorly continues as anterior intercostal membrane. The fibers travel downwards, forwards, and medially. They are most active during inspiration and help in elevating the ribs along with supporting intercostal space structurally and functionally. They originate superiorly to lateral edge of the rib above and insert inferiorly to the superior margin of the rib below deep to the attachment of the related intercostal muscle. They are innervated from the intercostal nerves with root value T1 – T11 and help in depression of ribs while being active at expiration and support the intercostal space. They originate from medial edge of the costal groove above and insert at internal side of superior margin of the rib below. They are innervated by intercostal nerves T1 – T11. They function together with internal intercostal muscles. It is a thin plane of muscular and tendinous fibers, situated upon the inner surface of the front wall of the chest. It lies in the same plane as the subcostal muscles and the innermost intercostal muscles. It attaches superiorly through second to sixth ribs from inferior borders and internal surfaces of costal cartillages and inferiorly through inferior aspect of deep surface of body of sternum, xiphoid process, and costal cartilages of ribs IV—VII. It is innervated by intercostal nerves. It helps in depressing costal cartillages. It originates from Inner surface of rib near sternal angle and inserts in Inner surface of 2nd or 3rd ribs below. It is confined to posterior parts of lower spaces only but its fibers travel upwards, forwards and medially. It helps in depression of ribs. It originates from Lower l/3rd of the posterior surface of the body of sternum, Posterior surface of xiphoid process, and Posterior surface of costal cartilages of lower 3 or 4 ribs near sternum and it inserts in costal cartilages 2nd to 6th ribs. It spans the Inner surface of front wall of chest. It pulls 2nd to 6th cartilages downwards. Its fibers are directed upwards and laterally. The intercostal muscles tend to pull the ribs nearer to one another when they contract. While in inspiration, in the root of the neck if the 1st rib is set by the contraction of the muscles, the scaleni muscles namely, then the intercostal muscles elevate the 2nd to the 12th ribs toward the first rib. If otherwise as in expiration, the oblique muscles of the abdomen, the 1st to the 11th ribs will be lowered by the contraction of the intercostal muscles and the 12th rib is set by the quadratus lumborum muscle. Furthermore, the tone of the intercostal muscles helps to reinforce the tissues of the intercostal spaces while the different stages of respiration, thus preventing the pulling in or the propelling out of the tissues along with the alterations in intrathoracic pressure.